Think Webstore (Think) opened in January of 2008 and has apparently found a way… around the recessed economy. Rather than facing shrinking, like so many businesses in their industry and outside their industry, they have continued to grow through the down economy. Think Webstore opens and is a full service marketing and advertising company located in Ridgeland, Mississippi. While they are known for their online work, including websites, social media and search engine optimization (SEO), they offer a range of services including all types of graphic design work, print advertising, television advertising, and radio advertising. 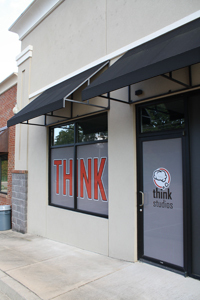 Many local companies have used Think for websites, logos, graphic design and more. Those companies fit in a wide range of businesses from restaurants to financial to industrial to medical. Local favorites like Ichiban, Primos Cafe, M&F Bank, Que Sera, The City of Ridgeland, Children’s Medical Group and more have visited Think for a variety of services. In fact, even the newly designed Dodge Chargers for the Ridgeland Police Department were designed locally at Think. The offices exude energy. The space is replete with robots and some “scientific” art. Strategically located next to Advanced Microsystems, the colocated companies provide businesses with services from design to marketing to information technology and computer repair to hosting. 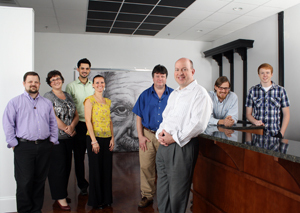 “The goal,” says Carter, “is always to make marketing, advertising and technology easy for our clients. Our mission statement is literally ‘To be helpful.’ “ For Think, quality is paramount and accountability is a big deal. A quick perusal of their website provides a plethora of examples of designs and websites. In a recessed economy it is always good to see companies succeed, especially companies that are in the business of helping other companies succeed. Bryan Carter is the Managing Partner at thinkWEBSTORE.com, a marketing and technology company located on Lake Harbour Drive in Ridgeland, Mississippi that specializes in marketing and website services. For more information visit www.thinkwebstore.com or call 601-856-2000.